In order to help with confusion between Shared Can (SC) and Bring Your Own Can (BYOC) fleets, this dedicated article has been created to expand on the details of mining in a BYOC as opposed to mining in a SC. BYOC's can be set up for both Ore and Ice mining, whereas SC's are rarely done for Ice. A BYOC has less organization than a SC. While this is a strong point that allows the flexibility that we all know and love, some additional considerations must be made by the miner when mining in a BYOC. Specifically hauling, buybacks, and personal safety. Mine a full jetcan, or two, then dock up, switch into a hauling ship, and bring them home. Continue mining. Mine for about 1 hour 45 minutes, then haul all the cans home in one trip. Mine into an Enormous Freight Container (EFC) which holds 250,000m3. These, before being launched, are 2,500m3 in size and can be dropped off by any T1 industrial. Once it is full, you can get the ore home a few different ways. EFC's also have the benefit of lasting until downtime, rather than just 2 hours. Make 5 trips back and forth in a Miasmos. 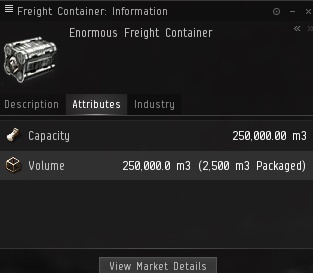 Use a Freighter to scoop the entire EFC up and haul it home. A freighter with 3 expanded cargo holds can fit up to 4 EFCs. Have all of your ore in place, such as in your item hangar at a station. Make sure you're in "list" or "details" mode. Highlight all of your ore and use ctrl-c to copy it. Paste the ore into the "Paste Inventory" tab of the spreadsheet. Go to the inventory page and at the top left, select Buyback -> Update Prices and wait for the script to finish. Select Buyback -> Prepare Buyback and wait for the script to finish. Ensure link sharing is turned on in Google Docs. There is safety in numbers! However, in a BYOC, you rarely have the safety of numbers to protect you. As a result it is important to follow general safety considerations. Always watch local for war targets or members of ganking corporations such as CODE. Be on mumble if at all possible. As with any other fleet, it is important to follow proper etiquette in order to ensure a cohesive and friendly environment. Though not required, it is polite to tip your fleet booster. The name of the booster should be linked in the MOTD of the fleet by the BYOC Boss in order to make this as easy as possible. The customary tip is 10% of the value of the ore mined. Some tip 10% of the boosted amount, i.e. the amount you would not have mined had there not been a booster. For an easy calculator, visit this spreadsheet. Either is acceptable, neither is required. The booster generally will set up the BYOC fleet, though not always. They will be in an Industrial Command Ship, providing up to three Mining Foreman Bursts. BYOC Boss needs to be passed to a new person before leaving the fleet if you are the current boss. Otherwise, the boss will automatically pass to the highest ranking member of the fleet, which is usually the AFK booster. That's anyone and everyone! Unlike for SC's there's no specific need to fly a covetor or hulk for max yield if you do not have a hauling alt. In these situations, a retriever or mackinaw may actually be preferable. This page was last modified on 11 March 2018, at 07:50.